Join The Listening Room Phoenix at the PHX Vegan Food Festival where it will provide amazing entertainment across three stages. 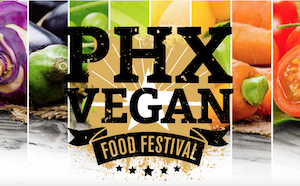 Davisson Entertainment is proud to present the 3rd Annual Phx Vegan Food Festival on February 24, 2018! We’re hosting some of Arizona’s favorite vegan restaurants and vendors! Enjoy a day of food, music and community. Event highlights include vegan food trucks and restaurants, vegan-friendly food and products, demonstrations and presentations by chefs and vegan experts, plus a kids’ activity area and VIP area. Tickets NOW ON SALE! Take advantage of EARLY BIRD pricing! VIP Admission includes: 1 hour early entry beginning at 10am, live entertainment, reserved seating area during chef demo’s, 2 beverage tokens to be redeemed for beer, wine, soda or tea, private VIP entrance, VIP swag bag and other added benefits. Beverage tokens may only be redeemed at beer & wine vendor tents, as well as at the concessions tent only. General Admission includes: Access to the event beginning at 11am, live entertainment and 1 beverage token to be redeemed for beer, wine, soda or tea. Beverage tokens may only be redeemed at beer & wine vendor tents, as well as at the concessions tent only. Kids 12 and under are free. Kids Admission does not include any beverage tokens or additional incentives. MORE VENDOR INFORMATION COMING SOON!